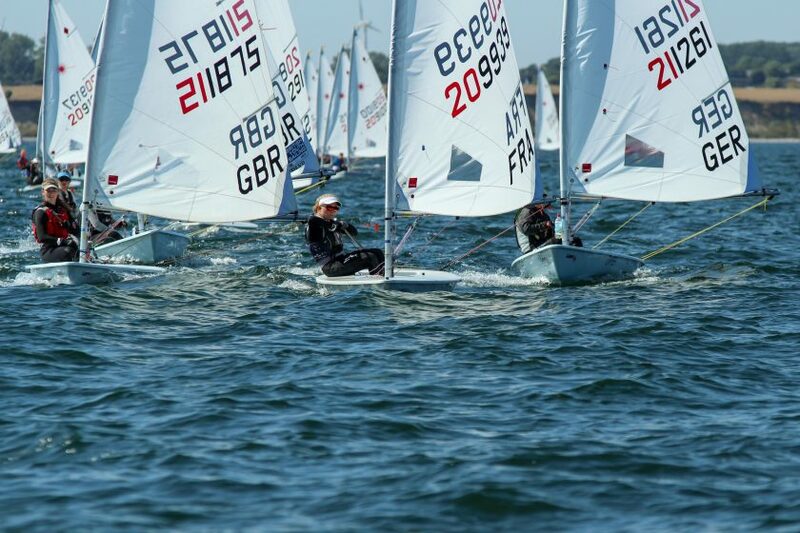 (Kiel, Germany) Sunshine, a ten-knot breeze, and choppy waters defined the last day of qualification races at the Laser Radial Youth Worlds in Kiel-Schilksee. Tomorrow, the fleets will be split and the Gold fleet will fight for the title. “This is when a new regatta starts,” said Francesco Viel from Italy, who is currently in the lead. Viel managed to defend his leading position with an 11th and 2nd today, but he was not so satisfied. “There will be new races tomorrow,” he said. “It was more difficult than yesterday.” He never lost control of the big picture and successfully chose the favored side. His compatriot Guido Gallinaro had an outstanding day today, with 3rd- and 1st-place finishes. He has climbed up to second place overall, heading into the final series only one point behind Viel and tied with Germany’s Julian Hoffman. For Hoffmann, it was a more difficult day. In the first race he finished in 40th, which he took as a discard, but has now bumped to third place on the leaderboard. 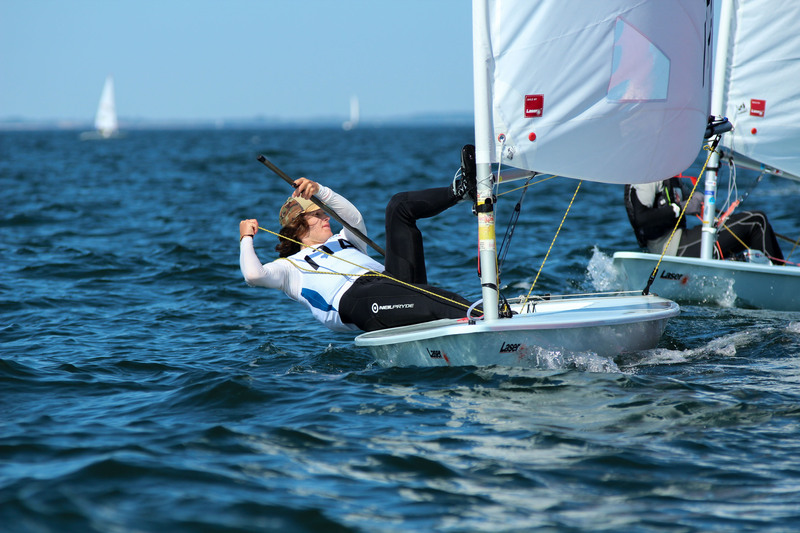 Germany’s Julia Buesselberg held her lead after the third day of racing. She finished with a 10th in the first race, then had a great start in the second race. On the initial upwind, she maintained her position in a small leading group, where compatriot Laura Schewe was not far behind. On the downwind, Schewe used her boatspeed to pass the others and increased her lead even more on the upwind, only to cross the finish line in first. “It went well on a sailing level, even though those were not my favorite conditions,” summarized the sailor from Altenholz. She said the light winds and choppy waves were a challenge. Although Buesselberg is still leading the fleet, she was not satisfied with the day. “It did not go the way I had imagined. Actually, it went quite well, but I was too slow on the downwind and lost there.” She had tried to adjust her technique to the different conditions, but she decided she did not take enough risks. 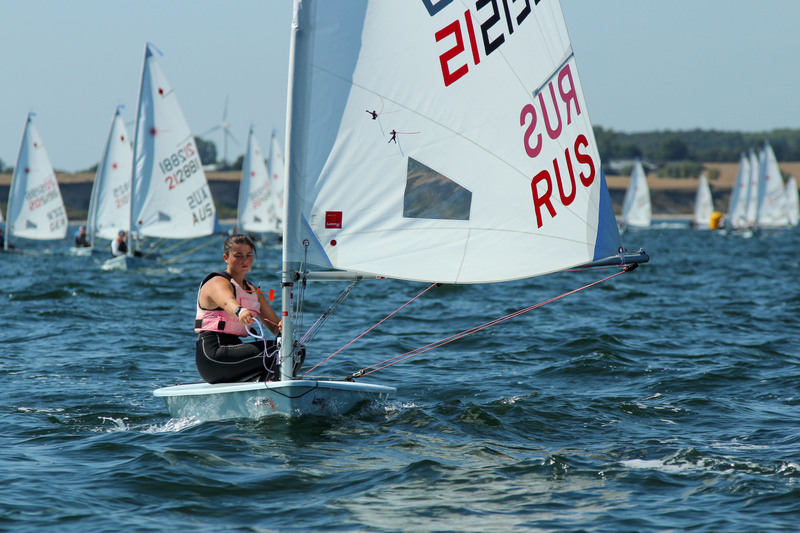 Another Italian sailor, Matilda Talluri stood out on the race course today. She played the shifts to her advantage and although she is not a big fan of light wind, she showed consistent performance. “As a sailor,” she explains, “you have to sail on a constant level in all conditions and you cannot be a specific wind type.” Maintaining her focus and consistency, Talluri finished with a 4th and a 5th today and is now sitting in second place heading into the final series. “The position is currently not important,” she shares. “There will be six more races and a lot can happen.” Eight points behind Talluri, Valeriya Lomatchenko of Russia is in third place after the six qualification races. For tomorrow, the girls’ division will be divided into two 48-boat fleets, Gold and Silver. The boys will be split into four 68-boat fleets, Gold, Silver, Bronze, and Emerald.